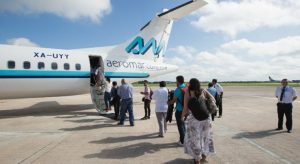 A reduction of time in transfers allowing more business appointments, competitive rates and easier family visits are some of the benefits associated with the new Aeromar Airlines flight Mérida-Cancun-Mérida, which launched Wednesday June 28. On board an ATR 72-600 aircraft, Rafael Tomasini, who travels constantly to the neighboring state for work, highlighted what it represents for users, especially for those who have to take flights to other countries. “This is certainly a great development that we have. This gives us many facilities to all those who travel for business, because it gives us the guarantee to return the same day in a very short time and thus, to spend more time with the family,” he pointed out. In that sense, the airline estimates that 25 percent of seats will be for business travelers seeking efficient and agile connectivity. For Maria Canché Castillo, having this direct flight means strengthening ties, as it will be easier to visit her grandparents who live alone in Cancun. She said that sometimes, through work and school, it is difficult to see them often. Now we can get to meetings faster and take off the same day, said the young woman who planned a surprise visit to her relatives. The new route will allow to establish an airlift with Cancún’s international airport, which will favor the connectivity between Yucatan and the more than 130 destinations to which over 60 airlines offer flights to and from Cancun. Rolando Rivero Vergara, who traveled this day to go to the Civil Registry, stressed the importance of having this route, because many like him, will save time of waiting and transfer when it comes to carrying out paperwork.